A quick reminder about our blogmeet on Tuesday, August 28 from 6:30- 8:30 at Common Bar on Edge Street. 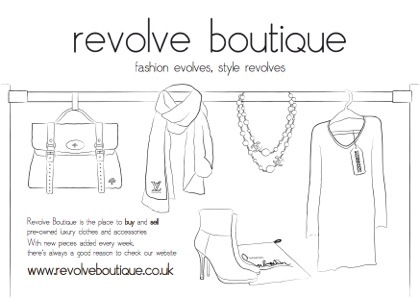 And one change to announce: our previously-announced sponsor Hannah Makes Things has sadly had to cancel, but we have an equally wonderful replacement in Blackburn-based Revolve Boutique. Sophia Smith (right), the woman behind the pre-owned designer clothes and jewelry online emporium, will be on hand to introduce the site and share her tips for decluttering your wardrobe. And bloggers with designer clothes or accessories they no longer feel the love for are welcome to bring them along and see if Sophia can help them find a new home and make you some dosh. To buy more clothes and accessories, natch. But even if you're the kind of blogger for whom designer fashion is, erm... not a priority, get yourself down to Common and meet your friendly blogging compatriots. It's a very laid-back evening of informal conversation over a beer or coffee, and anyone with a blog is very welcome. Drop in for a chat. Images courtesy of Conker Communications. If you've been reading this blog for a while, you probably know I'm the organiser of the Manchester Blog Awards, which started seven years ago. It happened in the cafe bar at then-Urbis. We were sharing the bill with a rather serious poetry reading night, and there were maybe 25 people there and most of them were probably there for the poetry. There weren't very many bloggers in Manchester back then. It still felt like we were doing something new (though this was by no means the actual dawn of blogging or anything.) It was exciting just meeting another blogger. Over the last seven years, thanks to the support of Manchester Literature Festival, Arts Council England, and Manchester Digital Development Agency, we evolved into a bigger and better event - and, we like to think, helped a fair few writers (and photograpers and illustrators) in this city become better known, better supported or at least more fired up about their work. I know I'm biased, but Manchester's blogging community is pretty freaking awesome. And now we're evolving again: We've just announced that the Manchester Blog Awards is becoming the Blog North Awards, and will merge with the Blog North network and events series organised jointly by my writing organisation Openstories, Manchester-based webzine Creative Tourist and artblog emporium The Culture Vulture from Leeds. I'll still be the main organiser and it will still be a part of the programme of Manchester Literature Festival, but it will now be open to bloggers across the North. And there are some new categories just to shake things up a bit: We'll be handing out awards for Best Food and Drink Blog, Best Young Blogger and Best Specialist Blog alongside our past categories of Best Arts and Culture Blog, Best Personal Blog, Best Writing on a Blog and Best City or Neighbourhood Blog on 17 October at The Deaf Institute. Over on the Manchester Literature Festival Blog I spoke to Sarah-Clare Conlon about the event and answered some questions about why we're changing things and the state of blogging in general. I'm really looking forward to reading great blogs from Yorkshire, Cumbria, Merseyside, Northumberland and everywhere in between. And there are lots of them to read: 205 blogs are in the running as of today (gosh, I'd better get back to reading them.) You can enter your own blog or a blog you love reading over on our Blog North Awards website, where you'll also find all kinds of information about the competition and the event. And to keep up to speed on everything you can follow us on Twitter @blognorth or Facebook. Happy blogging.